Given that Intel has no competition, it is perhaps easy to roll out a new mainstream performance champion – all they have to do is have more stringent binning techniques (like perhaps AMD with the FX-9000 series) and a few processors with a higher frequency could pop-out. The danger here is that Intel always sells a lot of its top performer – millions. If you have to dump 100 processors to find one that fits the mold of the top SKU, you either have to charge lots for it or reduce the rules. The only way to get that mix of yield and viability is by improving how the CPU is made. This is what the ‘optimization’ in Kaby Lake is for. The Core i7-7700K sits at the top of the stack, and performs like it. 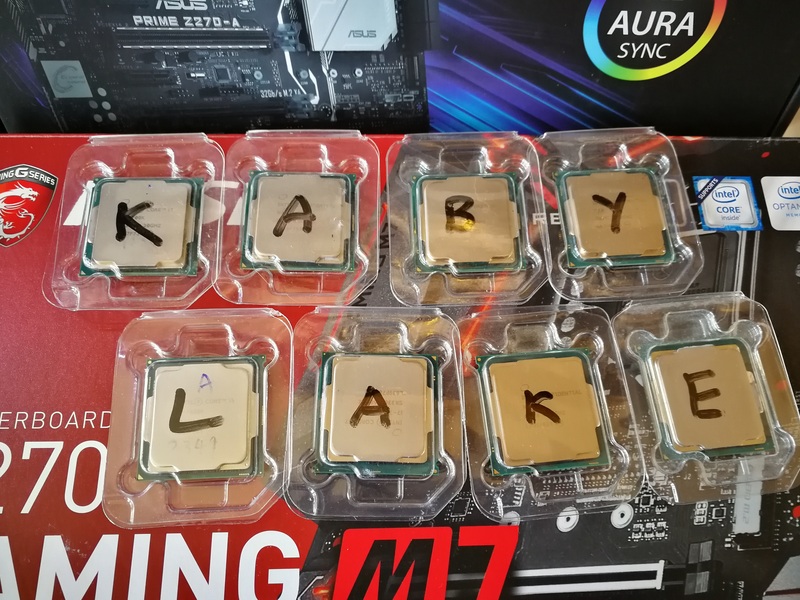 A number of enthusiasts complained when they launched the Skylake Core i7-6700K with a 4.0/4.2 GHz rating, as this was below the 4.0/4.4 GHz rating of the older Core i7-4790K. At this level, 200-400 MHz has been roughly the difference of a generational IPC upgrade, so users ended up with similar performing chips and the difference was more in the overclocking. However, given the Core i7-7700K comes out of the box with a 4.2/4.5 GHz arrangement, and support for Speed Shift v2, it handily mops the floor with the Devil’s Canyon part, resigning it to history. In most of our benchmarks, the results are clear: a stock Core i7-7700K beat our overclocked Core i7-4790K in practically every CPU-based test (Our GPU tests showed little change). When overclocked, the i7-7700K just pushed out a bigger lead for only a few more watts. Technically one could argue that because this part and the i7-6700K are equal in IPC, a similar overclock with the i7-6700K achieves the same performance. But the crucial matter here is how lucky a user is with the silicon lottery – based on our testing, the Core i7-7700K CPUs tend to overclock rather nicely (although +300 MHz isn’t that much in the grand scheme of things). As with previous high-end mainstream (if that sounds like an oxymoron, it is) Core i7 parts, Intel has put a list price of $303 on 1k tray units, which means that at retail we should see it nearer $330 to $350. As far as we can tell, this won’t get a stock cooler, and anyway we’d recommend something else anyway given the recent performance of Intel stock coolers. We can hope that we won’t see the blatant price gouging we saw when the Skylake parts were launched, where it took several months to bring the prices down to MSRP due to stock allocations. The Core i7-7700K should be available from January 5th in most major markets. It’s the new mainstream performance king, if CPU performance is your thing. As part of our Kaby Lake coverage, we have some other awesome reviews to check out. @OP: It is a mistake that you did not explicitly state the OC of the chips you compared. The only thing I am interested right now is the release pf the 1080TI, so please ANANDTECH do your best to bring us some news (preview) regarding. CPU releases are completely uninteresting and by-and-large meaningless to anyone on a K Sandy Bridge CPU. Yeah.. there isn't really much of a jump is there? Buying a 7700K for people already on High End I7's made in the past few years is more about ... just wanting something newer, with maybe taking advantage of what some of the newest MBs offer.. I think anyway. Speed? Pfft... you already got that..
"Given that Intel has no competition, it is perhaps easy to roll out a new mainstream performance champion".